Egypt’s chaos and revolution: The Egyptian military’s crackdown cannot return the country to what it was. And what can’t be taken away. CAIRO—No matter how many times you witness it, the transformation is still a dizzying one. Kiosks that once sold chocolate and cigarettes, deployed as a gunman’s shield. Shop-window shutters framing sugar-sopped cakes or risqué clothes mannequins, now the roughage of a street barricade and clouded in teargas. Rooftops normally barnacled with satellite dishes and humming air-conditioning units, now specked with sniper rifle sights. All that familiar stuff, wrenched from an old reality and pressed into use as something different. Two and a half years in, the shift from mundane to martial remains disorienting. What is happening in Egypt and what is being lost? Lives, above all else; hundreds of them—on the streets of Cairo mainly, but also outside the capital in towns and villages beyond the gaze of the global media. It feels remarkable to have to say this when the sentiment is so obvious, but in the bitter atmosphere of recrimination and accusation that seemingly pervades all debate in Egypt at present, it must be said nonetheless: The biggest tragedy of recent weeks is the death of so many, and the maiming of so many more. But beyond people, something else is being lost—just as those most invested in the old Egypt intended. For me, the most powerful expression of Egypt’s revolution has never been anything tangible, but rather that state of mind when the world seems to tip on its head and bevel with possibility, where the landscape of imagination is recast. I first encountered it on Jan. 25, 2011, as I marched alongside a group of anti-Mubarak protesters down the corniche in central Cairo, and felt a heart-pounding distortion of the air as a line of armed central security forces fanned across the road with their shields up, blocking the path ahead. Before that day, I’d attended countless demonstrations of a few dozen Egyptians shunted to some inconspicuous corner of the street, a tight bristle of political energy marooned in an ocean of black-clad troops. The deployment of the police across the road in front of us was a signal that the next part of this script was about to commence; we would be blocked, come to a stop, engage in some minor scuffling, and then be herded into a harmless protest pen so that Cairo could get on with its day. But on this occasion, with reports of mass unrest spreading throughout the city, something was different. None of the marchers slowed, nobody broke ranks, and instead they just kept on going, right toward those shields, chanting and glaring mutinously into the eyes of those that held them—each of whom glanced uneasily at one another and wondered how to respond. In the end, the troops simply gave way. And as we pushed past them and onto the empty street behind them, several protesters broke into a run—or, more accurately, a skip, a dance, a hodgepodge of hops and jumps. Many began whooping and hollering and even kissing the ground. Doubtless more important things were happening elsewhere at that moment, beyond that little carpet of liberated asphalt. Episodes of much greater drama would unfold afterward, both that evening as security forces broke the occupation of Tahrir Square with volleys of tear gas, and three days later, when more than 100 police stations were burned to a cinder and Egypt’s people finally forced Mubarak’s security forces to flee into the night. But for me, that single moment—when those around me spontaneously decided to break through the police line and rewrite a mothballed script from the bottom up, that nanosecond where a street was reclaimed and everything in the old universe seemed to stagger, pitch, and tumble forward into infinite opportunity—that was revolution, distilled to its purest form. It felt like a tiresome step dance had just gone freestyle as the performers rethought their collective horizons and careened wildly into a space they had always been told was not for them. It felt like nothing could be the same again. That newfound sense of agency, of an ability to shape the world around you in ways you never knew existed—that gave me my definition of revolution: not a time-bound event, nor a shuffle of rules and faces, but rather a buckling of physical and mental borders from below. Nothing can pose a greater threat to elites wishing to preserve their political and economic privileges than that sense of agency, and since Egypt’s revolution began not a single farm, factory, classroom, or college has remained entirely immune from its influence. 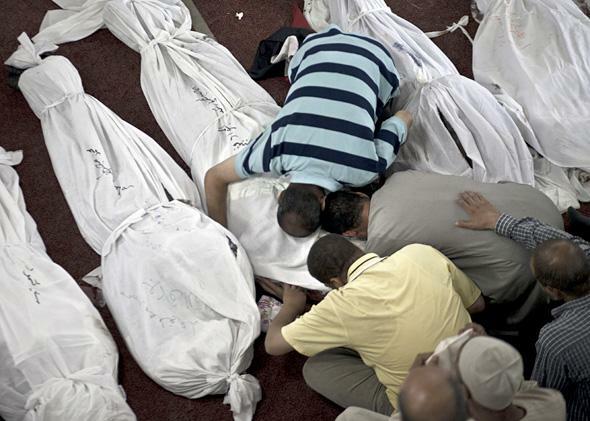 Which brings us to the scenes on Egypt’s streets in recent weeks. The relentless imposition of state violence creates binaries as well as bodies: You are either with us or against us, pro-military or pro-Brotherhood, an Egyptian or a terrorist. And binaries from above achieve the opposite of imagination from below. When everything is an either/or, and the contours of change are set from on high, it becomes that much harder to even dream of creating your own alternatives because every line of independent thought is subjugated by a more fundamental dichotomy: On whose side do you stand? Judith Butler, the feminist philosopher who has faced opprobrium for her condemnation of the Israeli occupation, has spoken of how her critics seek to destroy the conditions of audibility and force a reality in which one cannot speak out against injustice, a reality in which such words of dissent cannot even be heard. How Egypt’s defenders of the status quo, forced on their heels by a revolution that struggles against authoritarianism and state violence, have longed to similarly destroy the conditions of audibility. In their current “war on terror,” as the ticker on state television puts it, they finally have the enemy, the fight, and the stage on which to do so. Thus far, their efforts are meeting with spectacular success. Of course the leadership of the Muslim Brotherhood have also played their part in perpetuating false binaries; from the beginning they have viewed the revolution as a rolling opportunity for a private power-grab, never allowing that it could be a process of change for all Egyptians, never permitting the possibility that their exclusionary, often sectarian discourse could provoke a backlash. At its highest echelons, this is the movement that tried to silence those chanting against military rule in November 2011 and then, once democratically elected, used its time in power to harness the old Mubarak security apparatus to its own ends rather than destroying it. The movement that hammered through the most partisan, divisive constitution imaginable for a post-Mubarak nation and then arrested and tortured those activists daring to speak out against the retrograde, toxic path being trodden by Egypt’s new political elite. Yes, Mohamed Morsi won power fairly through the ballot box, but democracy does not end in the polling booth. In an ongoing revolutionary moment, after watching the Brotherhood roll out the red carpet to every element of the old state whose foundations had been so dramatically shaken by popular unrest—from the army generals to the country’s corrupt neoliberal tycoons—millions of Egyptians took to the streets once again and withdrew their consent to be governed. Emboldened and protected by Morsi’s multiple concessions to them, the security forces saw their chance to turn the tables not just on the Brotherhood, but on the very notion of there being any alternative to elite politics, any alternative to the omnipotence of brutal state power. And so a new narrative—of patriotic soldiers versus jihadi terrorists—took shape, and so much has withered in its wake. In this arena of guns and certainties, the revolution’s other fault lines fade to darkness. We can no longer hear the voices of residents of Ramlet Bulaq—a poor settlement without running water in the shadow of corporate behemoth Nile City Towers. Here residents, denied access to the infrastructure riches all around them, are resisting forced eviction aimed at clearing the way for further high-end construction—part of an elite urban development strategy pursued by the old regime, continued by the Brotherhood, and defended by the junta that reigns today. We can no longer hear the chants of collective hope floating up from Qursaya, an island in the Nile likewise earmarked for luxury property-building, where the local farmers and fishermen have twice fought off deadly invasions by the armed forces—once under Mubarak and once under Morsi. We can longer hear the inspiring discussions of workers at a ceramics plant on the Suez Canal who, tired of their terrible working conditions and all of management’s broken promises, besieged their politically-connected boss in his car before my own eyes and began talking excitedly about what it would be like to run the factory themselves. Nearly all of the individuals in these communities had joined the protests against Mubarak, voted optimistically for Morsi, and then joined the massive mobilization against him a year later when they saw their revolution being hijacked and betrayed. Their struggles—often dismissively labelled as “parochial” by Egyptian elites—and the feeling of ground-level empowerment and agency which enabled them, are the revolution. And in a binary Egypt whose existential future depends on an all-powerful security apparatus being strong enough to defeat a relentless wave of terrorists, no one can hear them roar. In such an Egypt, it seems absurdly idealistic to believe that any note of revolutionary dissent might break through. But before 2011, when Mubarak was still the darling of the West and former finance minister Youssef Boutros Ghali—asked at a dinner party whether he was worried Egyptians might revolt against a new tax law that concentrated even more wealth in the hands of the most privileged—could reply with a chuckle, “Don’t worry. This is Egypt … We’ve taught the Egyptians to accept anything,” it seemed absurdly idealistic to believe that a revolution might erupt at all; a few months later, Egypt changed the world. In February 2011 when Mubarak, in response to unprecedented protests, was removed by the generals and the latter were riding a wave of patriotic populism, it seemed absurdly idealistic to believe that a movement opposing the incarceration of civilians by the military and calling for an end to junta rule would amount to anything; by November, a new uprising had shaken the armed forces to its core. Egyptians, as the past two and a half years have shown, are liable to take to the streets and provoke a crisis for whatever elite settlement is being foisted upon them. Right now, amid an almost fascistic excess of hyper-jingoism, the prospects seem dim for a revolutionary struggle against authoritarianism, one which rejects false binaries and articulates the slogans of the currently tiny Third Square movement—“no Mubarak, no Morsi, no SCAF.” But absurd idealism, not just in Egypt but in cities across the globe that have been at least partly inspired by Egypt’s turmoil, from Rio to Athens to Istanbul, has astounded us all in recent years. Those hoping that the people have lost their voice should not rest easy in their beds.